I am trying to restore a past revision on a page where I am using Cornerstone. Is there a way to do this? When I select a past revision in the WordPress “Publish” section, then go to edit in Cornerstone, the revision does not change. I understand that changes made outside of Cornerstone are not saved within Cornerstone – is there a revision history built into Cornerstone? We’re sorry but Cornerstone does not work with revisions. WordPress Revisions affect server performance greatly so that is not recommended to use. If you need backup or need to save previous versions of your work, you can save as template and import it when needed. So there is no option of restoring former versions of what I have build before? Since it still shows in wordpress … would be really great if there was a way to do so. #following – Would be a great feature to revert back to something if you messed something up like I just did instead of having to redo it all over. We add your feedback to our lists. Thank you. Yes, please add revisions to Cornerstone. I spent a long time figuring out that it didn’t work and blew away a bunch of work. If revisions did not work with Cornerstone, it should have been communicated very very clearly up front. That is a major missing feature. Well, it’s not really a feature – you’ve removed basic expected functionality of WordPress. Please get that going! I’ve bought several X licenses and this gives me pause about getting another one. In a multi-designer scenario, saving “templates” is just not going to work. I can’t see any reason that if you can save a template, you should also be able to save any time and see revisions. Looking forward to revisions in Cornerstone though! Very glad to hear that. There is added revision feature for the cornerstone, but it’s not properly syncing with WordPress’s revision. Switching revision date back and forth would erase your post_meta revision. 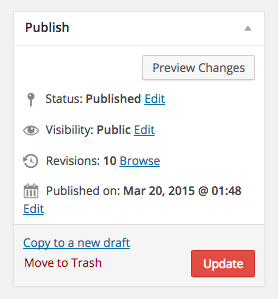 WordPress’s default revision is only applicable for post_content. Please let me know WHERE we need to VOTE and/or Communicate that a REVISION option is necessary for X Themes. I see that you mention above… “All of these items are discussed with our team internally and prioritized based on the amount of interest a particular feature might receive.” – but how do we communicate INTEREST to make it a priority? Not to mention… based on “normal” user… they might not realize that REVISIONS WON’T work (until something goes wrong). No one ever uses Fire Insurance until their house has burned down. REVISIONS is my fire insurance. Thanks for updating this thread! We certainly appreciate the feedback! This has been added to our enhancements list and our developers is already working on this feature. Once they’ll have it ready, it will be updated and will be rolled in our future update releases.